As a professional builder of wooden decks since 1998, we understand the importance of selecting quality patio deck materials. Here are some advantages and disadvantages of the materials we use in the construction of patio decks and also those that we do not use. Made from various combinations of waste wood fibers, non-renewable petroleum products and a small percentage of recycled plastics, composite decking materials are often used in the construction of decks. The main advantage of this type of decking is its resistance to rot and insects. Composite decking materials are also not subject to cracking or warping. 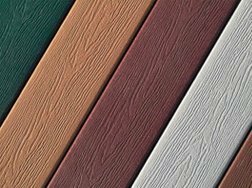 Furthermore, decks made ​​with this material can last more than 25 years, and they do not require application of a stain. However, since composite decking materials are made with a non-renewable petroleum products and many other chemicals (and with each manufacturer using its own secret recipe), they can’t be recycled and they are not biodegradable; so they will accumulate in our landfills – already filled to capacity. Cleaning is also difficult in terms of food stains, greases and liquids. 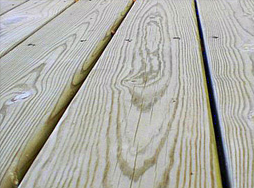 Similarly, composite decking materials may be prone to mildew stains caused by the accumulation of moisture in the wood fibers wrapped in the synthetic polymers. Also, the sun makes composite decking very hot for your feet when walking barefoot and the UV rays will eventually create color changes and fading. Finally, due to their low strength/weight ratio, composite decking materials can not be used as a structural material, and a larger number of joists is needed to compensate for its low structural strength. Lastly, according to the humidity rate and temperature changes, there may be opening and closing of the joints due to the expansion and contraction of the wooden structure. Another material we use in the construction of our decks is pressure treated wood. Woods such as spruce, pine and fir are commonly pressure-treated with ACQ (Alkaline Copper Quaternary), a chemical preservative that prolongs the lifespan of wood used in exterior construction. Some disadvantages of treated wood are the appearance of cracking after installation during the drying period, its frequent warping and its chemical composition. The chemical composition of treated wood was changed to ACQ in 2004 from the original CCA (Chromated Copper Arsenate) and we don’t know yet the toxicological long-term effects of the new treatment. Patios et Clôtures Beaulieu uses pressure treated wood only for the structure of it’s decks (the joists and the beams). For the parts exposed to the elements like the floor, the stairs, the skirt, the railing or a pergola, we use Western Red Cedar or Brazilian Ipé. Western Red Cedar and Ipé are more durable and naturally protected against insects and decay. 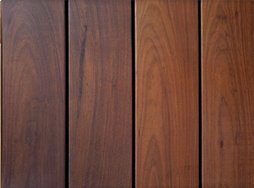 Ipe wood is a material harvested from FSC regulated forests of Brazil, known for its strength and durability (between 40 and 50 years). This wood does not require any specific treatment due to its high natural resistance to moisture, weathering and damage caused by insects. In addition, Ipe wood is very resistant to fire, almost at the same level as cement. The diversity of its color varies from light brown, dark brown and, red- brown. Maintaining an ipe deck is a quick process once or twice a year. Simply wash the deck with water and mild soap than apply a layer of oil to keep its color. On the other hand, an ipe deck requires more time to build because of the difficulty of drilling and cutting of wood. It is indeed a very strong and dense material that requires different methods of cutting and anchoring as those used for other types of wood such as red cedar or treated wood. In average, a deck made of ipe will be 30% more expensive than a cedar deck but this price is more than offset by its durability and ease of maintenance. For centuries, carpenters and craftsmen valued Western Red Cedar for its natural beauty and durability. The red cedar we use is from Western Canada, where logging is regulated to ensure the resource is sustained. 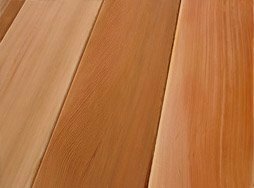 Western Red cedar is popular most of all for its appearance and durability. Its fine, straight grain, outstanding strength/weight ratio and low rate of expansion and contraction make it a much sought-after species. It is an environmentally-friendly product since it does not need to be treated. Red cedar contains natural oils that make it resistant to moisture, insects and decay. As well, it is highly resistant to warping and cracking. – A natural product that resists decay, mold and insect damage, it does not require a chemical treatment. – Lifespan of more than 25 years in exterior construction. – Resistant to cracking and warping. – Light and easy to work with. – Centuries of proven performance in construction. – Easy to clean off food, grease and liquid stains. – Low expansion and contraction. – Does not heat up in the summer. – Warm colours ranging from pale amber to honey brown. – Very low environmental impact. – Natural beauty, without equal. 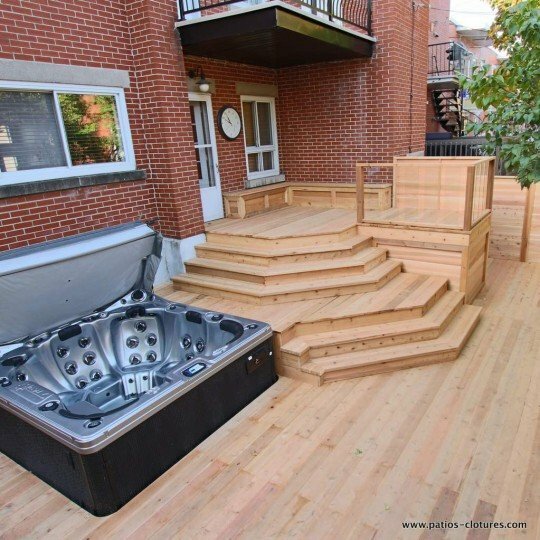 Stéphan et son équipe ont fait un travail colossal afin de construire un patio, une clôture de même qu’un balcon qui amalgame également un spas. Dès la première rencontre avec Stéphan j’ai pu constater sa grande compétence à répondre à nos questions et a nos attentes de même que la passion qui animait son travail. Nous sommes entièrement satisfait du beau travail exécuté à notre résidence d’autant plus que le réaménagement était majeur compte tenu qu’ill consistait a rebâtir entièrement la cours arrière d’un duplex complètement gazonné. L’équipe que menait Alex était toujours d’une bonne humeur et intentionné et les travaux se sont exécutés sans embûche et dans le respect de l’environnement. Merci a toute l’équipe de Patios et clôtures Beaulieu.